Hi everyone! 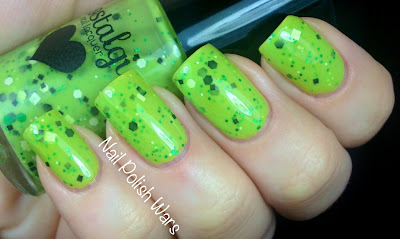 I am beyond thrilled to have a chance to show you some amazing polishes from Nostalgic Nail Lacquer!! Like Lovin' the Dead is a soft green jelly loaded with black, white, and green multi-sized hexes and squares. The formula is super smooth and easy to apply. It's fun and stunning at the same time! Shown is two coats over OPI Don't Talk Bach to Me. The Brain is a soft yellow jelly loaded with medium blue hexes, and light blue mini hexes. This is another perfect formula!! I absolutely love the way the blue hexes compliment the soft yellow hue. 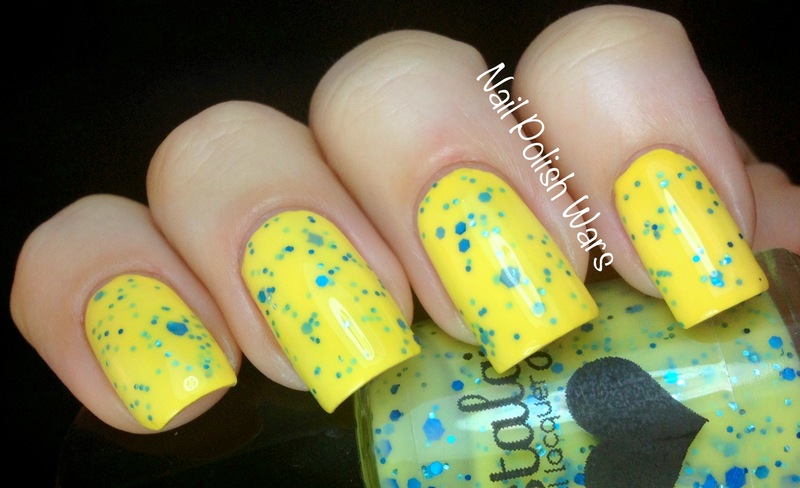 Shown is two coats over Sally Hansen Lightning. The Basketcase is a clear coat packed with gunmetal grey and pink hexes, burgundy mini hexes, and black and pink micro glitter. This is a dream to apply! The glitter glides on so smoothly!! Shown is two coats over Orly Synchro. 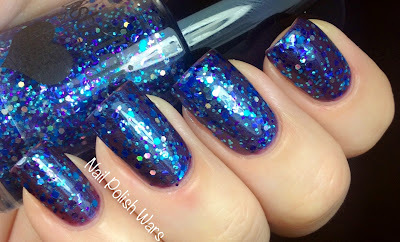 Rio is a clear coat packed with blue, purple, and silver holographic muli-sized hexes. Again, an awesome formula and smooth application! 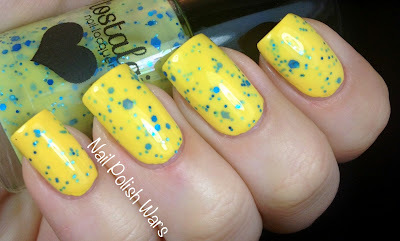 This is a truly dazzling polish!! Shown is two coats over Orly Mysterious Curse. Date at Midnight with Nosferatu is a medium grey creme with mini and micro hot pink hexes. This was a dream to apply, so smooth and so easily buildable for a slightly sheer polish. I am totally in love with this one!!! I am absolutely over the moon for these amazing polishes! If you haven't snagged any of these yet, I highly recommend them! They definitely do not disappoint!! Yellow and blue are my favorite combo colors I have always loved them together and The Brain is so pretty I want it just to look at the bottle. I couldn't pull it off like you do though your nails look great! 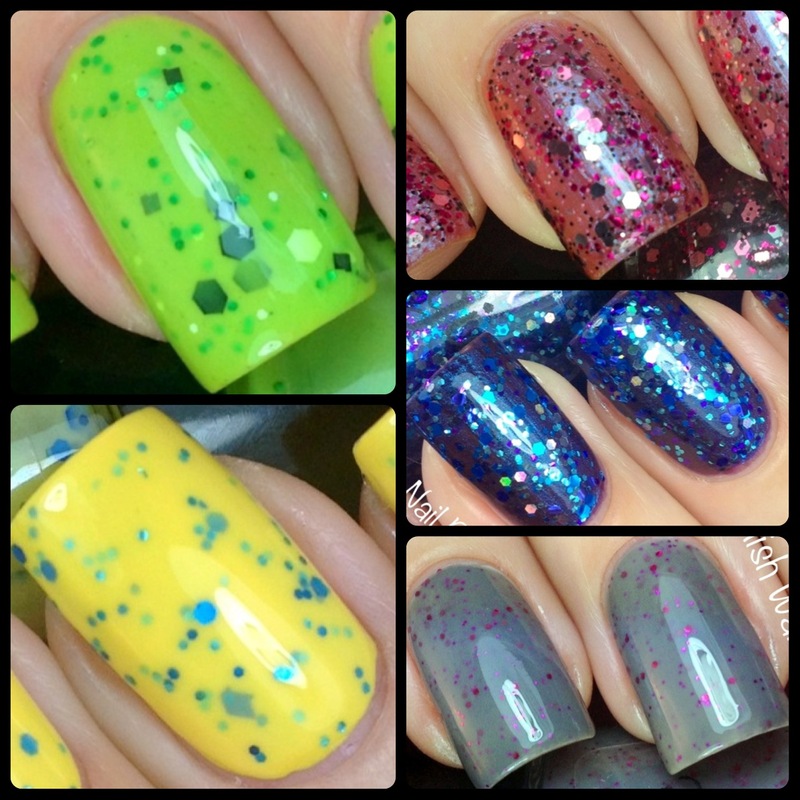 Wow, these polishes are so unique! I love The Brain and Date at Midnight with Nosferatu!